Thanks to the committee for giving us members a swinging night at the Tennis Club for our Christmas party on 12 December. More than 40 souls braved the bad weather and enjoyed festive fare, followed by several hours of dancing, singing and carousing. Sausages and chips made a welcome appearance just after midnight. We all appreciate the dedication of the committee for organising the caterers and DJ, making the room festive and clearing it up afterwards. A special shout out to those who provided delicious deserts on the night – we savoured every morsel. The festive fun didn’t stop at the Christmas party. On 20 December, we made our annual trip to Ardmore for the Mulled Wine and Mince Pies walk. The weather gods gave us respite from the relentless rain and we walked along the cliffs in brilliant sunshine. There was a celebrity wedding en route which we stopped to gawk at. There were valiant, enthusiastic attempts to sing carols. Santa hats were worn by some. Thanks to all who made mulled wine, mince pies and other treats, which were sampled with gusto. 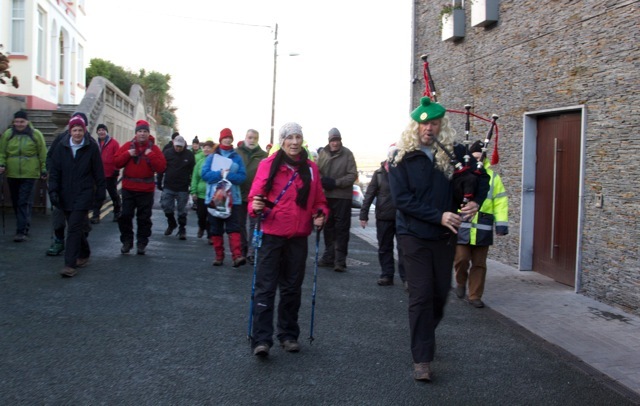 40 walkers took part and they raised €219 for the Lions Club when a bucket was passed around after the walk. Ireland is full of fabulous walks and we’ll be exploring some of them in Wicklow, for the annual club weekend away from 22-24 April. We’ll be staying at Lynam’s of Laragh, and the price for two nights B&B and an evening mean is €130. Book your place with any member of the committee, as that trip is a hot ticket. 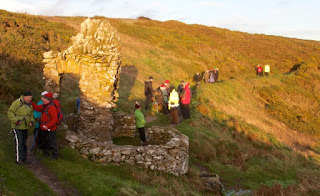 For those who have embraced the 21st century, Dungarvan Hillwalking Club has a healthy presence on Facebook. 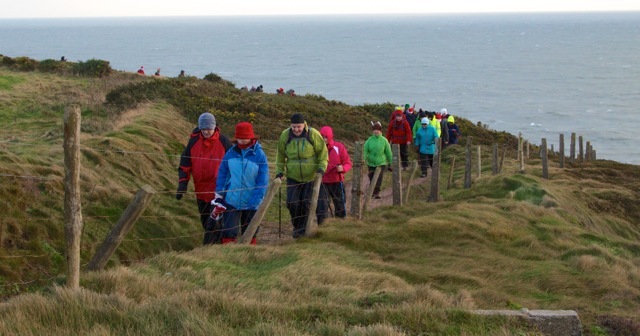 There is a page for the general public called Dungarvan Hillwalking Club, and a group for members and prospective members called Members of Dungarvan Hillwalking Club. 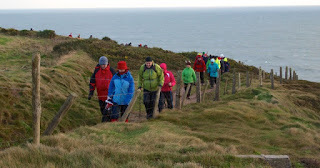 The Official Dungarvan Hillwalking Club and Supporters of Comeragh Crossing Facebook pages have now been deleted, but those who were on the previous pages are welcome to join the new ones. You'll find them by typing their names into the search box on Facebook.